1. What are the advantages of 2b-RAD? CD Genomics is proud to offer advanced 2b-RAD sequencing technology, which harbors numerous advantages over original RADseq and GBS. The comparison between different reduced representation whole genome sequencing method is outlined in Table 1. Table 1. Technical comparison between 2b-RAD and other NGS-based reduced representation genotyping methods. 2. What are the disadvantages of 2b-RAD? Although 2b-RAD is a powerful method for high-throughput genotyping, but it also has some drawbacks. 2b-RAD works only on diploid species. Additionally, the short tags may not be long enough for locus discrimination in complex genomes. 3. How is the 2b-RAD library prepared? The library construction for 2b-RAD consists of four major stages (BsaXI digestion, ligation, amplification and barcoding). 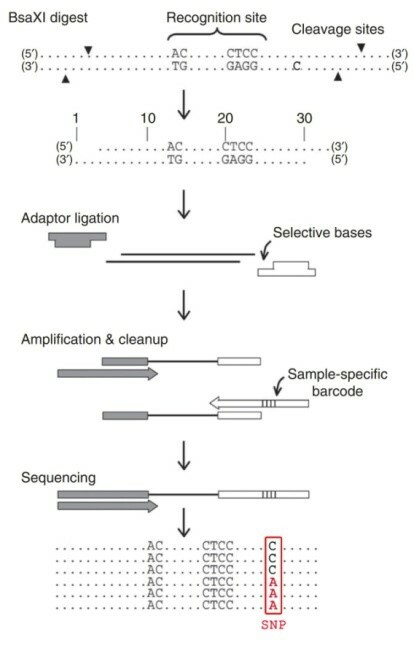 Following DNA digestion by BsaXI, adaptors are ligated to the fragments through cohesive-end, and specific barcodes are incorporated into each sample through PCR amplification using degenerated linkers. Then the single-tag constructs are produced using modified adaptors and biotin-labeled primers, which can be further digested by SapI to generate distinct cohesive ends and then ligated in a predefined order to produce five concatenated tags. Samples are then pooled and sequenced using Illumina technology. Figure 1. Schematic overview of the 2b-RAD procedure. 4. Can 2b-RAD detect SNP in repetitive regions? 2b-RAD may not detect SNP in repetitive regions that include a small number of restriction sites. 5. How many individuals are required for the construction of linkage map? At least more than 100 individuals are necessary for constructing genetic linkage map. 6. For natural populations, how many samples are required? Natural populations often have more SNP. The number of samples depends on the phenotype of interest, ranging from tens of samples to hundreds. The more samples you submit, the more accurate genotyping results you get. 7. What is the requirement for species? Diploids with or without a reference genome are suitable for 2b-RAD. However, polyploids for 2b-RAD had better have a reference genome, and risks are still existing.